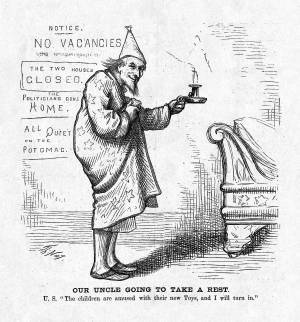 "Our Uncle Going to Take a Rest"
An appropriate final cartoon on the presidential election of 1876-1877. The new president, Rutherford Hayes, has been inaugurated, and the new Congress sworn in and adjourned. After much work and stress, Uncle Sam temporarily retires for a good night's sleep.